This week I want to tell a brief story of a courageous man I witnessed complete a very difficult task recently. I won’t spoil the episode by spilling it out here, however, I will use this witnessed event as a transition to discuss the topic of courage. The courage to make offers: “Oh geez, what if my offer gets accepted?” “What if the seller gets mad at me because my offer is too low or too creative?” Both of these situations can be overcome by simply having the courage to be different than everyone else in how you approach the situation. Instead of blindly sending over an offer via email, direct mail or even fax, take time to learn about why the seller is selling. Learn what they plan to do with the proceeds of the sale. Fear in offers getting accepted: Surprisingly this is a very common thing, and the courage to overcome it can sometimes feel impossible unless you are carrying a suitcase of cash! If you follow the steps above and take time to get to know the seller, you should feel better about the situation and be better prepared to have the courage to push through the process of funding the deal. Funding the deal could mean the seller accepting payments for their equity (which is more common than you might think), obtaining a bank loan and/or raising private capital for all or part of the monies needed to close on the property. If you are anything like me, you disdain disappointing people. The reality is that it takes courage to get good at saying no when presented with an opportunity that simply does not meet your criteria. This can mean saying NO to a seller, a wholesaler or a Real Estate Broker. Although uncomfortable, it's critical to have the courage to walk away because you know deep down this is the right thing to do. As Robert Helms says “Do the math and the math will tell you what to do”. That statement means that you must do ALL the math and use factual data to support your calculation in order to keep from losing money. Investing is about earning returns, not taking losses, by slowing down and applying logic, confidence in your decision to proceed or walk away will be easier to achieve. 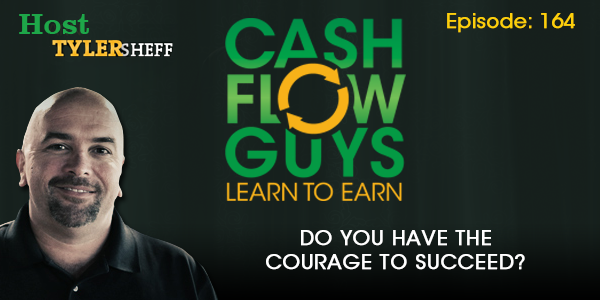 To get on the waiting list for the brand new Mailbox Money 101 course go to http://Cashflowguys.com/MailboxMoney101 to be notified the minute the course is available.